The fantastic Autoptic show is happening again in 2015, and they are taking exhibitor applications starting today. If you are a cartoonist who can be in Minneapolis next August, you’ll probably want to apply. 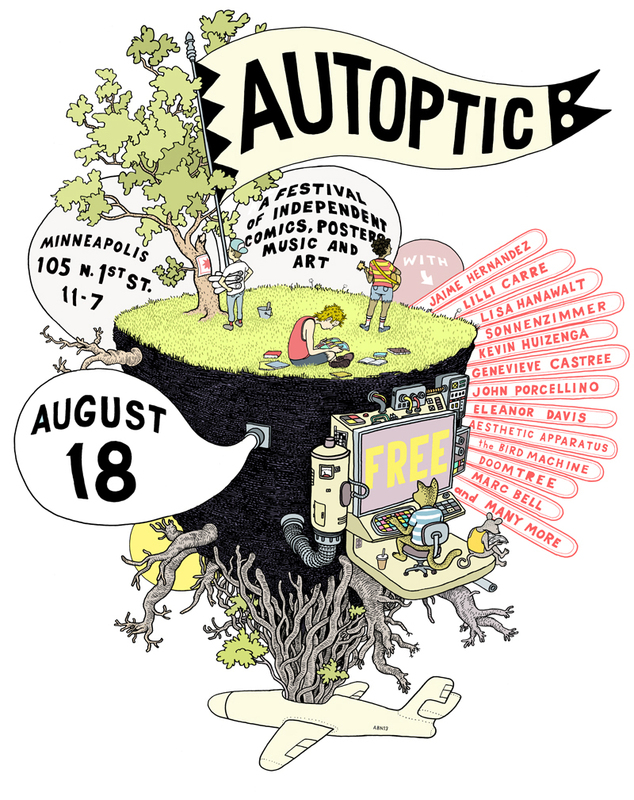 So they’ve announced Autoptic, which manages a bunch of things roaring out of the gate: 1) the obvious involvement on some level of local art-comics anchor personalities Zak Sally, Tom Kaczynski and Anders Nilsen; 2) putting a show in the Twin Cities, which is a great part of the country and a great comics region; 3) finding a slightly different model for a show, which allows it a unique identity and doesn’t obliterate the chances that previous Minneapolis shows could return if they wanted; 4) picking a great time of the year that is both open in terms of small press stuff (particularly with fewer of those folks doing San Diego) and a great time of the year to head up to that region. If they execute the rest of this thing this well, watch out.